All councils consist of elected members (democratically elected councillors) and the administration (council employees). Every four years, the community elects councillors to represent their needs and participate in decision-making for their municipality. The elected councillors appoint the Chief Executive Officer, set the strategic direction, participate in decision-making including the adoption of budgets and policies, and monitor the council’s overall performance. Councils hold regular public meetings to make decisions, which can be attended by members of the public. Councillors elect a Mayor as the leader and spokesperson for the council. 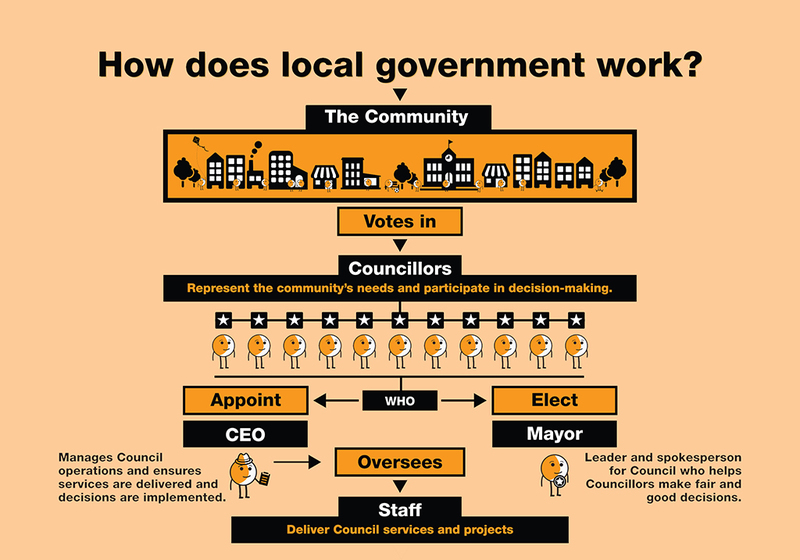 We thank the City of Greater Dandenong for permission to use this graphic explaining the role of local government. How does local government work? The community votes in councillors. Councillors represent the community's needs and participate in decision making. The councillors appoint a CEO who manages council operations and ensures services are delivered and decisions are implemented, and overseas the staff who deliver council services and projects. The councillors also elect a mayor who is the leader and spokesperson for council, and helps the councillors make fair and good decisions.